Take the runoff from every action thriller you have ever seen, put it in the blender, and you got "Salt." Made for fans of bland, forgettable action movies with terrible stories and zero style. The ads for Salt have asked the question “Who is Salt.” The answer is infinite. She is Dr. Richard Kimball (Harrison Ford’s character in The Fugitive). She is John Anderton (Tom Cruise’s character in Minority Report). She is Tom Bishop (Brad Pitt’s character from Spy Game). Even though this list can be filled with countless characters, by the end of the movie, you really don’t know anything about her flat character. “Who is Salt?” Who knows. 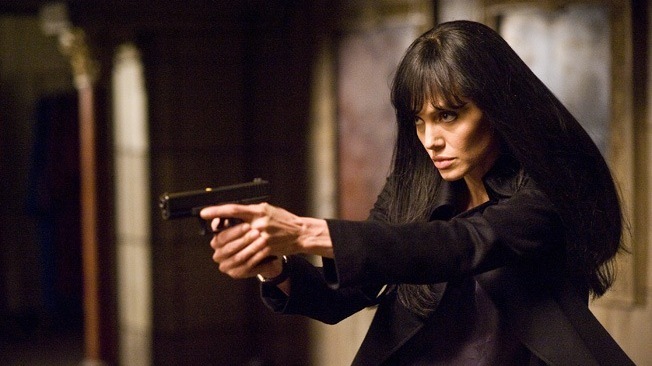 Angelina Jolie (Tomb Raider) plays C.I.A. special agent Evelyn Salt. When a Russian looking to leak secrets is brought into her office, she and her partner (Liev Schreiber, X-Men Origins: Wolverine) are sent in to interrogate. The man spouts crazy conspiracy theories about an unknown terrorist group in Russia that has been kidnapping American children for decades, brainwashing them, training them to be proficient in hand-to-hand combat and sending them back to America to await the activation of their terrorist cells for a major attack on the United States. Written off as being cuckoo for Cocoa Puffs, Salt ends the interrogation and begins to head home. As she is leaving, the crazy Russian says that the head assassin of the Russian terrorist cell is named “Salt.” Because he was never told her name during the interrogation, her partner and boss (Chiwetel Ejiofor, Children Of Men) begin to suspect her of being a double agent. To prove her innocence, Salt makes a break for it and becomes a hunted woman. The norm for summer blockbusters is to open with a gripping and engaging scene, usually containing an explosion or shoot-out. Salt opens with nothing. Nothing action-oriented happens within the first 20 minutes – and as if that wasn’t bad enough, nothing engaging happens in that time period either. If a movie fails to reel you in the first 20 minutes, it never will. The word around Hollywood is that the script for Salt was originally intended for Tom Cruise and that he turned it down because it was too similar to the first Mission: Impossible movie. After seeing Salt, I am convinced it is untrue; Tom Cruise turned it down because it was terrible script. If Tom Cruise turned it down, so should you. Grease Sing-A-Long Coming To Salt Lake City!